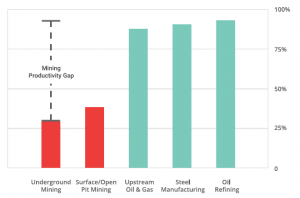 When it comes to OEE, mining is well behind other industries that have somewhat similar workflows (oil & gas, manufacturing). Moreover, measuring Overall Equipment Efficiency for underground mining equipment is becoming best practice in benchmarking progress, identifying losses, and improving the productivity of a fleet. The inability to gather real-time production data to guide instantaneous front-line decision making. No visibility, no ability to adjust plans during the shift. Having information/data, but not knowing how data delivers actionable and significant insights or solutions. 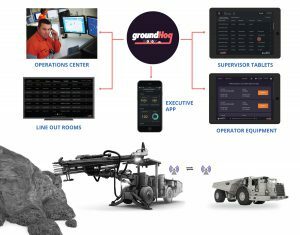 rapidBizApps has developed a solution to address these challenges: By implementing a Digital Short Interval Control (SIC) system with groundHog in underground mines, mining companies can improve the effectiveness of production within work shifts. SIC is a framework of structured processes to better manage shift tasks by regularly reviewing performance within a shift and evaluating where production stands relative to plan, which enables supervisors to enforce mid-course corrections that can improve the overall effectiveness and efficiency of production during a shift. Dispatch/Production Controllers/Mine Planners generate task schedules that are assigned and made available for supervisors and operators on their mobile devices. Schedules are dynamically updated based on task progress logged by operators on their mobile phones/tablets (or through machine telematics). Schedules are periodically auto-adjusted to achieve production goals based on information received. Equipment/Machinery are easily located and managed via location sensors such as Wi-Fi tags and mobile devices and visualized in 3D. This provides equipment occupancy analysis for the Mine Managers and Supervisors to help improve productivity. All the inspections are performed digitally giving easy access for Mine Managers and Supervisors to audit, review, and plan for delays associated with failed inspections. All data provided by operators while performing tasks are available to Mine Managers and Supervisors in real-time. This provides a Decision Support System that helps management plan resource allocation and production plans to achieve production goals. The groundHog-based SIC system empower miners in myriad ways. Modern Digital Short Interval Control properly implemented in underground mines improves the OEE between 20-35%. The graph below shows this. On the extreme left, the brown bar shows the existing OEE across mining. 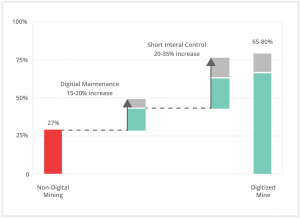 If you now add in the productivity improvements due to digital maintenance, you can increase OEE by as much as 20 percentage points. If you take the next step and commit to short interval control, you may see OEE improve by as much as another 35 percentage points. Take the first steps to implement short interval control today! Check out groundHog for mines. The groundHog is a mobile fleet management system optimized for underground mines. Designed to work out of the box, groundHog controls production, tracks, and schedules the workforce, and delivers deep insights to increase process efficiency. In summary, leveraging groundHog to build a safer, more efficient mine will ensure a boost in profitability.